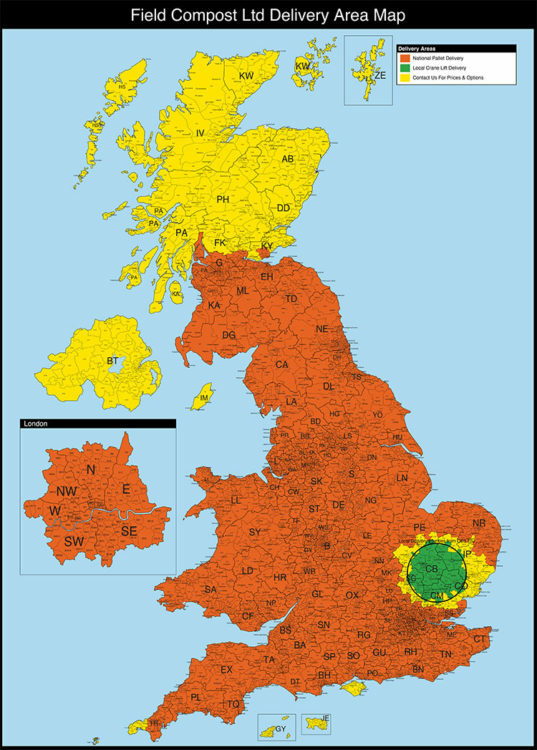 All products dispatched to our national delivery areas highlighted in brown/orange on the map will be delivered via our preferred pallet network contractor. Download a large PDF version of our National Delivery map. Subject to stock and availability national deliveries will normally take two working days from placing an order to the day of delivery (see table below for details). Make sure there is sufficient access at your delivery location for the delivery vehicle to unload the pallet. The lorry will be about the size of a dust cart (for detailed dimensions see below), if you need a smaller vehicle or are unsure please call us before placing an order online. 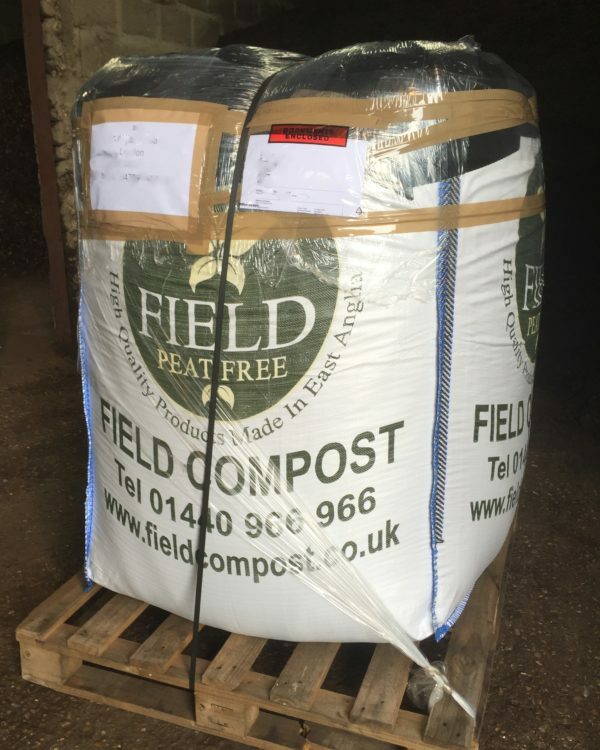 The bulk bag will be delivered on a pallet that is 1m wide x 1m long x 1.5m high and will weigh approximately 700kg (see picture below). Due to the heavy nature of this item it will be moved from the delivery lorry using a pallet trolley. The pallet trolley will be used manually to move the bag across smooth level surfaces (such as tarmac or concrete). The trolleys do not work on gravel drives, steeply sloped drives, grass and uneven surfaces, and cannot be lifted over walls, fences or into gardens. The drivers always make every effort to get the bags onto your driveway, however if this is not possible then the bags will be left at kerbside or on the pavement outside your property. 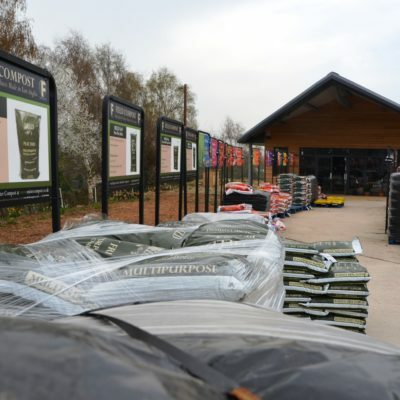 We can only guarantee delivery to kerbside or roadside, please ensure you are happy with this manner of delivery before placing your order. If you are not going to be in when the bag is delivered then it is important that you provide clear instructions on where the bag needs to be left. We ask that you provide us with a telephone number on which you can be contacted on the day of delivery. It is important that you can be contacted on the delivery day in case any queries or issues arise. A contact telephone number (Preferably a mobile and landline number) on which you can be contacted on the day of delivery. Accurate delivery address and postcode. Please include any gate codes or additional information that may assist the delivery driver. 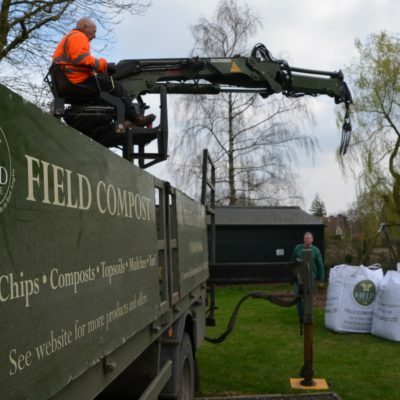 If you’re unsure of your delivery options, before you place your order please give us a call on 01440 966966 or email us sales@fieldcompost.co.uk and we’ll be happy to help. We can provide crane lift delivery within 25 miles of CB9 7SJ. See if there is a stockist of our products near you.